The collection that you will bind to RadGridView should implement IBindingList or IBindingListView interfaces. This will allow RadGridView to get notified about insert and delete operations of records. 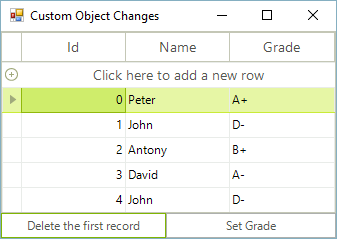 Your business objects should implement INotifyPropertyChanged interface (.NET 2.0). This will allow RadGridView to reflect changes which occur to the properties of the business objects. We will not only analyze the correct case that you should follow, but we will also analyze the cases where incorrect collections or business object implementations are used. This will allow you to understand what you can expect from RadGridView in the various cases. Before observing what will happen if we bind to an IBindingList collection, let's see what will actually happen if we bind RadGridView to a collection of a wrong type. Such a collection is List. 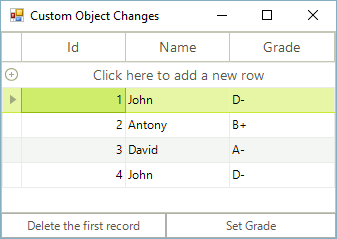 Although it is a generic collection and it is convenient for storing a number of business objects, it does not support the two-way binding mechanism needed for the purposes of the notifications. RadGridView is not synchronized, simply because nothing notifies it about the change in the collection. 1. Create a class called Student. This class will be the same as the class in the previous section, so we will not post the implementation here. collectionOfStudents(collectionOfStudents.Count - 1).Grade = "F"
You do not see a difference? This is normal and expected, because the type Student does not implement INotifyPropertyChanged, so the changes in the properties of the Student objects are not reflected in RadGridView. As you can see RadGridView successfully reflects the change in the Grade property that we make. 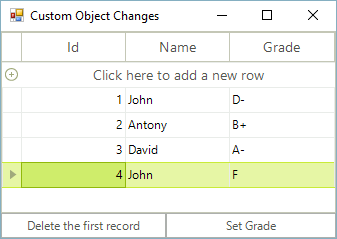 This is because of the improved Student object implements INotifyPropertyChanged and because of the BindingList that implements IBindingList.